The economy is teetering on the brink and thousands upon thousands of people are looking for a job. You would think that anyone who actually HAS a job would be grateful, but no. Leave it to a parking lot attendant at Target to showcase the problem with the Millennial generation – an atrocious sense of entitlement. Anthony Hardwick says he resents working at Target Corp. (TGT) on Thanksgiving and has garnered more than 37,000 signatures on an online protest petition. Hardwick, 29, who says he has been a Target parking attendant in Omaha, Nebraska, for three years, began the petition two weeks ago on the website Change.org after learning that he and his coworkers would be required to start at 11 p.m. Nov. 24 for a 10-hour shift. 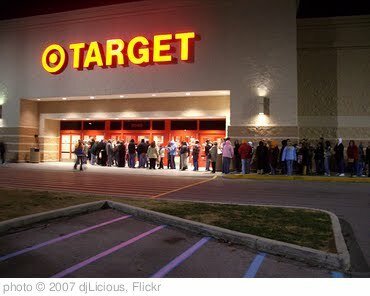 As of now, more than 9,000 75,520 (as of 10:24 p.m.) people have signed the petition asking Target HQ to wait until 5 a.m. on Black Friday to open the stores. Don’t doctors and nurses have to work on Thanksgiving? What about police officers and firefighters? A holiday with family is just for the “elite?” Are you kidding me? I guess we can’t miss an opportunity to play the class warfare card, however ridiculous. Do these people wonder why its hard to find a job? Note to the Millenials who think this guy has a valid complaint: When you take a job, you accept a list of responsibilities. Don’t complain when someone asks you to do your job, because there are thousands of people out there who would be happy to switch places with you and work at 11 p.m. on Thanksgiving to get the first paycheck they’ve seen in months. The world does not revolve around you and your Turkey dinner.